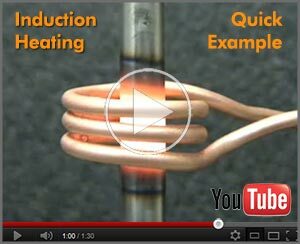 Induction heating is a process which is used to bond, harden or soften metals or other conductive materials. For many modern manufacturing processes, induction heating offers an attractive combination of speed, consistency and control. 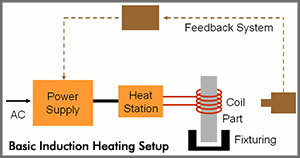 Induction heating relies on the unique characteristics of radio frequency (RF) energy - that portion of the electromagnetic spectrum below infrared and microwave energy. Since heat is transferred to the product via electromagnetic waves, the part never comes into direct contact with any flame, the inductor itself does not get hot (see Figure 1), and there is no product contamination. When properly set up, the process becomes very repeatable and controllable. In a basic induction heating setup shown in Figure 2, a solid state RF power supply sends an AC current through an inductor (often a copper coil),and the part to be heated (the workpiece) is placed inside the inductor. The inductor serves as the transformer primary and the part to be heated becomes a short circuit secondary. When a metal part is placed within the inductor and enters the magnetic field, circulating eddy currents are induced within the part. 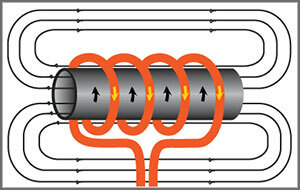 As shown in Figure 3, these eddy currents flow against the electrical resistivity of the metal, generating precise and localized heat without any direct contact between the part and the inductor. This heating occurs with both magnetic and non-magnetic parts, and is often referred to as the "Joule effect", referring to Joule's first law – a scientific formula expressing the relationship between heat produced by electrical current passed through a conductor. With conductive materials, about 85% of the heating effect occurs on the surface or "skin" of the part; the heating intensity diminishes as the distance from the surface increases.So small or thin parts generally heat more quickly than large thick parts, especially if the larger parts need to be heated all the way through. Research has shown a relationship between the frequency of the alternating current and the heating depth of penetration: the higher the frequency, the shallower the heating in the part. Frequencies of 100 to 400 kHz produce relatively high-energy heat, ideal for quickly heating small parts or the surface/skin of larger parts. For deep, penetrating heat, longer heating cycles at lower frequencies of 5 to 30 kHz have been shown to be most effective. Fig. 1: This short video clip shows how the part never touches the inductor coil.